A renderer defines a set of symbols that will be used for graphics in a layer. You can use renderers to symbolize features with different colors or sizes based on a particular attribute. SimpleMarkerSymbol Symbolizes points with pre-defined shapes. PictureMarkerSymbol Symbolizes points with images. SimpleLineSymbol Symbolizes lines with pre-defined styles. CartographicLineSymbol Symbolizes lines with complex styles. SimpleFillSymbol Fill polygons with specfied color/style. PictureFillSymbol Fill polygons with image. 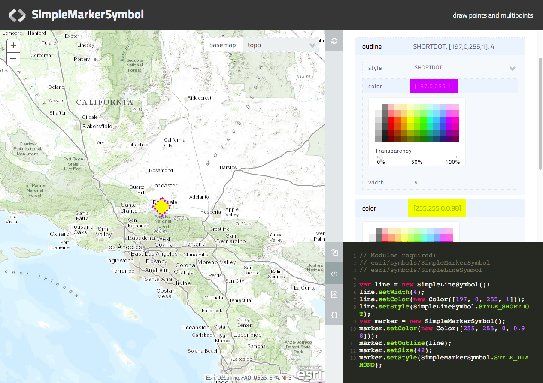 The ArcGIS Symbol Playground sample provides a place to explore symbol capabilities of the API. Here you can try out new features, customize them, and copy the generated code into your own application. This sample provides a starting point so as to allow use of these features as quickly as possible. It contains symbols such as, SimpleMarkerSymbol, SimpleLineSymbol, SimpleFillSymbol, CartographicLineSymbol, PictureMarkerSymbol, PictureFillSymbol, and TextSymbol. The playground displays the symbol in addition to providing an easy-to-use UI for modifying properties. Once modified, the symbol updates appropriately while updating the sample snippet displaying how it appears in code. The ArcGIS.com map viewer provides a nice collection of marker symbols that can be used to symbolize features on your map. Click here to view a sample application that allows you to select a symbol and generate the code needed to draw the symbol. To use this sample, just click a symbol and copy the resulting code for use in your application. For picture marker symbols, the application provides two options for generating the image. You can reference the image directly through a URL, or you can embed a string representation of the image (base 64 option in the sample app). When using the latter option the image is stored within the document instead of as an external resource so no http requests need to be made to display the image. Some browsers, notably Internet Explorer prior to version 8, do not support using base-64 data URIs in these cases the image url is used. A simple renderer uses the same symbol for every graphic. All you have to do is specify the symbol to be used by the renderer, then apply the renderer to the graphics layer. For example, suppose you have a "buildings" layer with an attribute that defines the building age. You want to symbolize buildings constructed since the year 2000 in green, buildings constructed between 1980 and 2000 in yellow, and buildings built before 1980 with red. This would be a good scenario for a class breaks renderer. Notice that if there is no maximum limit on a break, you can use "Infinity" for the maximum value. Similarly, you can use "-Infinity" when there is no minimum. Any value that is greater than or equal to the minimum will be included in the break. Any value that is less than the maximum will be included in the break. Thus, if you have two breaks 0 - 10 and 10 - 20, the value 10 would fall in the second break (10 - 20). Avoid creating overlapping breaks or gaps between breaks. A unique value renderer symbolizes groups of graphics that have matching attributes. This is most common with nominal, or string data. For example, you could use a unique value renderer to symbolize zoning designations: yellow for "Residential", purple for "Industrial", red for "Commercial", and so on. You can also use unique value renderers on numeric fields that are coded values, or on ordinal attributes such as "First", "Second", "Third", and so on. Values that you don't add to the list are drawn with the default symbol.